Wouldn’t it sound weird if you said the same thing to every person you encountered throughout the day? Well, think of your social media posts in the same way. Each platform is different, and your posts should be too. Even if you’re linking to the same content on your own website, each post on your various social media accounts should be tailored to succeed on that specific site in terms of tone and appearance. 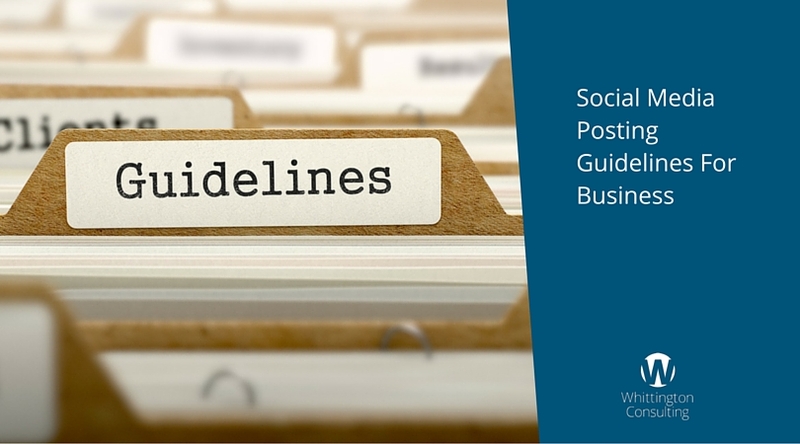 Here are some social media posting guidelines on Facebook, Twitter and LinkedIn. Facebook is for social sharing, so go ahead: add photos, add links, add events, add it all. The Facebook feed is very visually oriented, and aesthetics are important: use high quality photos (1,200×628 pixels is ideal) and replace visible URLs with well-written text to create a visually appealing post that arrests the eye. Photo-based posts (rather than text-based ones) actually get 39% more engagement on average. And remember to make it friendly–after all, Facebook is for your “friends,” right? Pro tip: One gentleman from a manufacturing company in the midwest told me that their Facebook feed “is like the company newsletter.” I thought that was great advice. Tweets, on the other hand, must be economical. They’re meant to be short and pithy and to capture the audience’s attention with intrigue and wit rather than explanation. Don’t worry about aesthetics here; just make sure you maximize your word allotment. Use tools like goo.gl or Bitly to shorten your links (many social sharing tools will shorten links for you automatically, too), saving space for valuable hashtags that increase your tweet’s exposure. You can also add photos (ideally 1,024×512 pixels) and tag them, neither of which takes up any of your 140 characters. Pro tip: We’ve found Twitter to be a great tool for finding influencers in an industry or on a topic, and also is good to send cues to search engines to index new pages you tweet about. While social sites like Facebook and Twitter can be used to share any relevant content, yours or not, LinkedIn is a more professional platform and your posts should reflect this. Companies and people often neglect posting to the LinkedIn news feed, even though it can send up to four times as many people to your homepage as Facebook and Twitter. This influx includes potential clients or even business partners, so try to highlight professional growth or achievements. An appropriate post might be an article you wrote that demonstrates your prowess in your field, or a link to a press release or news clip that sheds positive light on your company. Photos are also great on LinkedIn (are we seeing a theme here? ), but always make sure to adjust it to the optimum size. Pro tip: Your LinkedIn posts don’t just need to go on the company page. Encourage employees to share messages on their personal profiles as well, and make sure your personal profile on LinkedIn is as good as it can be, too. Now, there are certainly other social platforms that companies are using to generate awareness, find partners and drive website traffic, but managing too many social media platforms can be overwhelming because of the time involved and because you really need to tailor each of your messages to each social media platform for best results. Third-party applications like HootSuite can definitely make it easier and quicker to manage your social media accounts, but they’re not always the most effective method. By taking the time to ensure every post is optimized for its immediate audience instead of cross-posting the same one across all social media sites, you can leverage your content on each social media platform and ultimately drive traffic back to your company website. Finally, posting and managing social media could be a full time job for many B2B companies, so don’t spread yourself too thin. Consider scheduling social media posts so you have even distribution throughout the day/week/month.